Hello @Andy Somerfield I'm happy for this new update. Will download and revert here if i find anything that requires attention. I don't know what to say anymore even with bugs this is a significant upgrade. Its much faster and precise. Although it is not specific to this build or just to the betas, something I have always wondered about is why is this checkbox enabled on my iMac, which does not have an integrated GPU, & why does ticking or unticking it require a restart, since (AFAIK) it doesn't actually change anything in how the app performs? 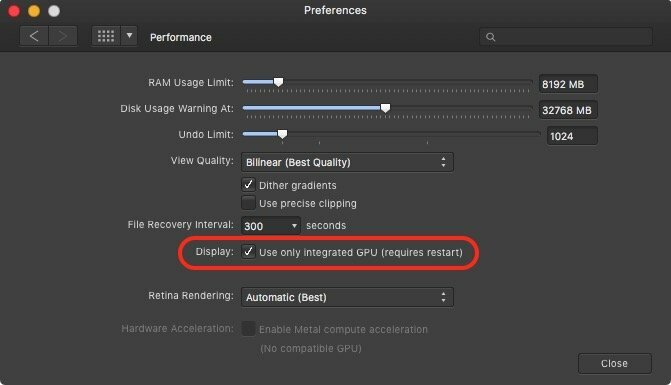 As you can see in the screenshot, the Hardware Acceleration checkbox is greyed out, which is expected because my iMac's NVIDIA GeForce GTX 660M is not supported for Metal compute acceleration. According to the System Report app, my GPU does support Metal for "feature set macOS GPUFamily1 v3" (whatever that is supposed to mean) but as I understand it that has nothing to do with Metal compute acceleration. Anyway, why isn't the integrated GPU checkbox greyed out like hardware acceleration one? For that matter, why is it preceded with "Display" with a colon, unlike any other checkbox in the preferences, & what does it refer to that the text following the checkbox already make perfectly clear? The other checkboxes are preceded by a label with a colon. Dither Gradients and Use Precise Clipping are both preceded by "View Quality:". Enable Metal Compute Acceleration is preceded by "Hardware Acceleration:". The same pattern can be seen in other sections of the app preferences. Dither Gradients and Use Precise Clipping are both preceded by "View Quality:"
OK, but "View Quality:" obviously pertains to the two popup choices for that, not to the two checkboxes below it. Besides, none of the checkboxes in the General, Color, User Interface, or Tools sections are preceded by any text, with or without a colon. "Display:" & Hardware Acceleration:" are the only ones that do, so I think it is reasonable to ask why that is. OK, but "View Quality:" obviously pertains to the two popup choices for that, not to the two checkboxes below it. No, "View Quality:" obviously pertains to the popup list of resampling options and the two checkboxes for dithered gradient and precise clipping options. The use of indentation makes the grouping obvious. Then why does the help topic say this? If it was meant to pertain to the checkboxes as well, why are three unindented bullet points instead of just one? Why does the first one specifically say to select from the pop-up menu? You are correct; there are inconsistencies. Not according to this Apple article. I stand corrected. I haven't owned an iMac in 10 years, only MacBook Pros. I wasn't aware about the non-GPU intel CPUs... but it makes sense for desktops which don't have the same energy / battery restrictions as laptops. Thanks for the insight! Affinity applications purchased from the MAS don't have a license code. You must have the stable version installed in order to run the beta. Thanks for replying ; my corollary question therefore is how do I convert my MAS licence into a standalone one ? I is kind of silly having 2 version of a >1gb program installed if it's to only use one of them. I like using bleeding edge and reporting bugs to help further development. I'm afraid that's not possible. If you purchased from the MAS recently enough you might be able to remove the program from your system and get a refund, then repurchase from Affinity directly. I don't know what the MAS return policies are, and in any case you would need to handle that with them, not with Serif/Affinity as the sales systems are totally separate. my corollary question therefore is how do I convert my MAS licence into a standalone one ? All MAS purchases are already 'standalone' versions; they just don't require a license key like the Mac Affinity ones bought from the Affinity store because the MAS ones are keyed to the Apple ID used to buy it. The Affinity Photo betas are customer betas, meaning you must have a retail version (from either store) installed to run them. They are betas because they are not yet bug free enough to use for critical work (like it says in the first post of this topic); for that you should use the installed retail version. The Affinity Photo betas are customer betas, meaning you must have a retail version (from either store) installed to run them. They are betas because they are not yet bug free enough to use for production work; for that you should use the installed retail version. Oh right, when I tried to install the beta, it only asked for the licence key, didn't seem to ask for the actual stable version to be installed. AFAIK, you must have the retail version installed to run the beta. If you bought it from the MAS, you should not be asked to provide a license key, unless possibly you moved the retail version out of the top level Applications folder where MAS apps are installed automatically, but even that seems unlikely. Are you sure it asked for a license key when you tried to run it? Yes it does if it cannot locate a licensed retail version (either a MAS version or one from the Serif store). You could have tested that for yourself by temporarily renaming your retail version and then launching the beta. However, we know from the first post by @Andy Somerfield that the customer beta has not been not submitted to the Mac App Store so there is no way to install it from there, & since @sashimi presumably has the MAS version installed (otherwise, why ask about converting it? ), I just wanted to keep things simple & make sure the message on that Mac did not say the only way to participate was to enter a valid product key. In retrospect, I see that I could have worded it better, but at the time (& before my first cup of coffee kicked in) it seemed OK. Sorry for any (extra) confusion that might have caused. No. @sashimi has purchased it but does not want to have both installed. Unless it was purchased on another Mac or it was uninstalled after purchase (or possibly the install process was aborted) it had to be installed on the Mac because the install happens automatically when you purchase an app from the MAS. That is what makes MAS apps a 'one click' process. Okay this beta is really good but ... something small that i feel is a bug. it is confusing because a created mask should display white fill (as in reveal state) and display a black fill (as in conceal) when inverted. have anyone noticed it yet ? i know it turns the opposite color when you paint with the brush on it but once again i should be able to see long time before i paint on it if it is a normal or an inverted mask. Please team, fix when you can. Thanks a lot for beta. A bug : emplacement is not defined but exif coordinates are there.